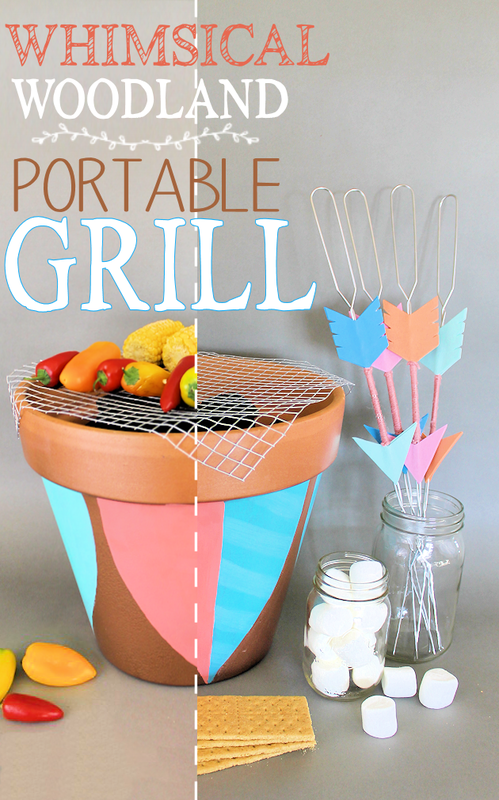 Make your summer sensational with this stunning DIY portable grill and skewer set! It’s a larger version of our Mini Campfire Smores Kit. This one is an inexpensive whimsical addition to your backyard barbecue. Not only is this simple and cost-effective, but it is sure to be a great conversation starter at your next get together. Great for every day grilling and late night S’mores on a warm summer evening. You won’t believe how easy it is to make. Can this be used on a wood table, or does it get too hot? I would be a little nervous with that. You could put a lot of sand in the bottom but I would still assume the clay pot would conduct the heat down to the bottom. You could always test if first on the dirt and see how hot the bottom gets with having a good deal of sand in it below the coals. I’m guessing it might still be too hot though. Never hurts to test it! My concern is the metal mesh, sometimes called hardware cloth. Isn’t it galvanized? If so, it will release toxic fumes when heated. Not so good for food. There was a discussion on this over on HomeTalk where I posted it… shoot… I can’t remember the details but I believe this type wasn’t galvanized. There are other options though if that’s a concern. It’s hard to find anything that’s not harmful now a days. Frustrating. Wow! What a great idea. I have just moved and do not have a grill. I miss it greatly. I love the ease and usefulness of this grill. I will be making this sometime this month. How wonderful. I can have a grill sooner than purchasing one. Thank You again! Thanks Sandy. So glad you found this useful! Thank you so much Linda. I really appreciate it! I love pinning your awesome creations! This is so great! I’m pinning it to the DIY Crush board. And next time my power goes out in the country, I’ll be able to eat a hot meal anyway. Thanks! So this is pretty much the cutest grill ever! What a brilliant idea! What a great idea! I cannot wait to do this myself. What a clever project! Great for a boho backyard birthday! Thanks Melanie! Indeed it would! This is a very fun idea! Good for older kids, esp. giving everyone their own individual s’more-maker. Visiting from Bewitchin’ Projects. Thank you so much Victoria. Appreciate you stopping by! Fabulous, and those skewers are just the cutest! Thanks for sharing on craft schooling Sunday! Hi, Nancy! I just love all the details you put into this project! What a beautiful paint job! Thanks for the wonderful post. Wow, that looks really great! Definitely something I’m going to make and use this summer! Thanks for sharing! I love this idea! I love how you painted the pot and made everything so special for the kids!